Oliver Gagliani: Scores of Abstraction. At the Santa Barbara Museum of Art. Shows through January 13. 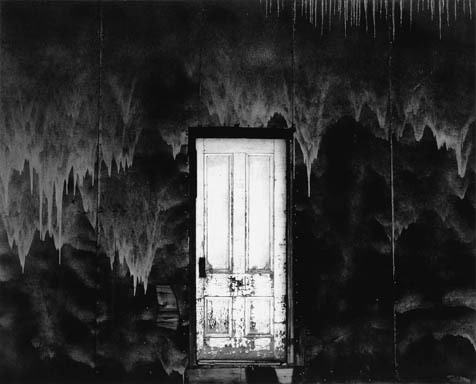 Oliver Gagliani's "Untitled (Door & Ice)," 1973. Before Photoshop and other digital media programs opened up the world of synthesized enhancement, photographers relied on framing, composition, and riveting subject matter to deliver the desired image. Among the many master photographers of the pre-digital age, Oliver Gagliani possessed a particularly preternatural ability to produce complex, imaginary landscapes that to the modern eye appear as if they must be digitally enhanced. In fact, Gagliani was a purist of the straight photography he learned as a journalistic and commercial photographer, and he achieved his abstract effects through simple methods of exposure and printing. Now on view at the Santa Barbara Museum of Art, Scores of Abstraction covers a large portion of the artist’s career, and includes 25 of Gagliani’s photographs from 1967 to 1994. The gem of the show is undoubtedly “Untitled (Door & Ice), 1973,” an image that perfectly encapsulates his oeuvre in a single shot. Much of Gagliani’s talent, beyond recognizing the spectacular in the mundane, is his ability to draw out the innate aesthetic qualities of the gelatin silver print. Although the door and surrounding ice are in high contrast, Gagliani has compressed their three-dimensional quality through careful composition, rendering the subject matter almost unrecognizable. Conversely, Gagliani’s series of photographs depicting patched and repaired tents at Yosemite National Park draws out the spectrum of gray tones in silver prints. Geometrical patches are sewn on the tents with black thread or adhered with tar-like glue that drips down the military-issued canvas. To an untrained eye, these instances of ingenuity would have been unremarkable. But Gagliani teases out their potential as isolated moments of abstracted beauty, framing them as individual canvases where the patchwork’s palpable texture and undulating lines become poetic gesture. Gagliani’s work is demanding because he requires us to reverse our typical methods of observation, forcing us first to “see” his compositions as a series of shapes, textures, and tones rather than as identifiable subjects. Through his imaginative lens, objects appear in new ways, and we are forced to reconsider and reevaluate the world around us as a landscape of unclaimed possibility.